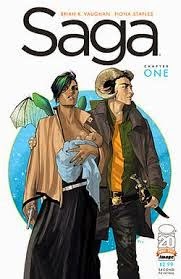 Saga: Volume 1 and 2 by Brian K. Vaughan and Fiona Staples - I ended up flaking on Vaughan's Y: The Last Man after one volume, and with that series spanning a dozen or so of the things it seemed easier to pick up his new one than to go back. Regardless of Y's charms, this was probably the right choice, because Saga has grabbed me in a way that Vaughan's earlier series never did. Narrated by Hazel, whose birth kicks the story off, it focuses on the efforts of her parents, Alana and Marko, to survive and protect their child. Soldiers from opposite sides of a centuries-long war, Alana and Marko are on the run from their former armies, multiple bounty hunters, and former friends and family, and the introduction of each of these parties only serves to expand Saga's wide, deranged universe. Moving back and forth between Marko and Alana's present as they try to adjust to parenthood and stay alive, their past as they meet and fall in love under less than ideal circumstances (Alana was a guard at the hard labor camp where Marko was incarcerated), and subplots involving the various characters pursuing them--a robot prince still reeling from his own experiences on the battlefield, a lovelorn bounty hunter, Marko's former fiancée Gwendolyn--Saga builds its story strand by strand in a way that is a joy to puzzle out. Along the way, it also drops hints about the history of the story's world and the war that has been tearing it apart, challenging the various characters' belief in its justness while also revealing just how much blood has already been spilled. What's perhaps most impressive about all this is that for all that Saga is wide-ranging and seems to proliferate characters with almost every issue, there's never a sense that Vaughan and Staples don't know exactly where their story is going and how all its pieces tie together. I'm very much looking forward to the future issues where they do. Swordspoint by Ellen Kushner - The best reading experiences are the ones that seem to come out of nowhere and sweep you off your feet. So it was with Swordspoint, a dilapidated, ancient copy of which I found in a used bookstore a few months ago and picked up on the vague recollection of having heard good things about it. As it turns out, Kushner's slim (barely 250 pages) 1987 debut is a remarkably assured fantasy that lays out a world and its customs in the space of a few pages and then sends half a dozen vivid characters on a collision course with each other in which the stakes are intensely personal--love and honor--and thus the most important thing in the world. Richard St. Vier is a swordsman, employed by nobles to fight on their behalf in the duels with which they settle their disputes. His origins are decidedly lower-class, but his skill and role confer upon him some level of privilege--the nobles admire him, though they don't see him as entirely human, and his fellow inhabitants in the rough neighborhood of Riverside embrace him as a mascot, but are also constantly on the lookout for the next up-and-comer who will take Richard's life and his place. Richard becomes embroiled in political machinations up on the hill, but these are not the cold-blooded clockwork plans we might expect, but instead driven by passions, misunderstandings, and hurt pride. They end up encompassing Richard's lover Alec, who has his own mysterious past, and nobleman Michael Godwin, who is drawn to the swordsman's life but is too caught up in his upper class upbringing to understand the kind of sacrifice it requires of him. At the heart of most interactions in Swordspoint is the assumption that only certain people are allowed to feel certain things--that someone like Richard has no honor of his own, only the honor he fights for, and that nobles like Michael aren't driven by feelings like jealousy or fear. Both of these assumptions turns out to be false, of course, and Kushner is adept at getting at the beating, human heart of every character in the space of a few sentences, of establishing the pettiness or the greatness of spirit that lie just where you least expect them. The result is a fantasy whose richness stems less from its strange world than from the minute, achingly human detailing of its familiar one. 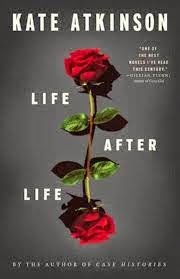 Life After Life by Kate Atkinson - It's always a problem, coming to one of the most celebrated books of the year a few months after the buzz for it has reached a feverish crescendo. You tend to take the things that are good about the book for granted--and Life After Life is very well written (I can't recall the last 600-page book that I breezed through as effortlessly as this one) and handles its central gimmick, the fact that its heroine dies and is then reborn again and again, each time with a subconscious knowledge of the lives she lived before, with impressive aplomb--while searching for a greatness that may not actually exist. That's not to dismiss the use to which Atkinson puts her reincarnation device, through which she can create both a panoramic picture of English life before and during the world wars, and an intimate portrait of a single family. The multiple deaths of heroine Ursula have different valences at different points in the novel--when, as a child, she tries with increasing desperation to avoid being exposed to the Spanish flu, her repeated failures, which involve slapsticky measures such as pushing the maid who will expose her down the stairs to prevent her from going out on the town, are darkly funny. But later, when Ursula keeps being killed in the Blitz, her deaths give the novel a claustrophobic feeling, a sensation of being trapped much like the people in London at the time. Meanwhile, the longer chapters which follow a single one of Ursula's lives in detail have their own power--in one, she is raped as a teenager and is so consumed by self-loathing (and by the recriminations of her family) that she falls into the clutches of a vicious, controlling abuser. In another, she falls in love on a pre-war trip to Germany, and finds herself in the Fuhrer's inner circle when the war breaks out. In a third, she lives safely and unremarkably as a civil servant, dying of a heart attack on a park bench on the day of her retirement. But while Life After Life's pieces are well done and occasionally remarkable, I have no idea what to make of its whole. While reading the novel, I tried to resist the temptation to work out a cosmology governing Ursula's reincarnations, because this is clearly not something that Atkinson is interested in--the novel, for example, opens with Ursula killing Hitler, but this turns out to be a futile, meaningless gesture that has little bearing on the rest of her lives, and if there are rules governing what Ursula can do in each life and how they change in response to her actions in previous iterations, they change so frequently as to be effectively meaningless. But what that means is that I have no idea what Atkinson was trying to accomplish, and Life After Life's gimmick eventually comes to seem like a way of putting a new gloss on the kind of pre-war social novel that has been written dozens of times before--or in fact, of writing all of those social novels at once, since each of them, taken individually, is familiar and not terribly original. The farther I get from Life After Life, the more it fades in my mind--neither its individual pieces nor its whole have the power to linger. Longbourn by Jo Baker - I've mostly avoided the vast field of Austen-ian para-literature, but Baker's Pride and Prejudice-below-stairs retelling caught my eye because of one promotional quote: "If Elizabeth Bennet had the washing of her own petticoats, Sarah often thought, she'd most likely be a sight more careful with them." Austen is often criticized for having proto-second wave blind spots. For caring about the happiness and self-actualization of upper and middle class women without giving a thought to the safety and well-being of lower class ones, and for railing against the stifling lives of women who are not allowed to work without noticing that their lifestyle was enabled by the labor of women who were expected to work, and whose work was undervalued if not invisible. Making that point by referencing one of the key moments of Pride and Prejudice--Elizabeth walking to Netherfield through muddy fields without a thought for her appearance, thus establishing herself as a "modern" woman--seemed to promise a cutting subversion of the original novel. 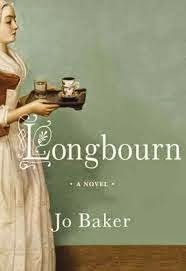 But Longbourn, as it turns out, isn't really a retelling of Pride and Prejudice--whose events don't start until more than halfway into the novel, and are never as crucial to the servant characters as Baker's invented plot strands. Instead, Baker uses Longbourn as the setting for a broader discussion of the life of a Regency servant (which among other things means that her story travels to parts of the house and the town that Austen's characters don't see, or at least don't talk about) and as a launching point for her own plot, which indulges in the kind of flights of melodrama that Austen frequently crooked an eyebrow at in her own writing--hidden parentage, unacknowledged half-siblings, deserting soldiers, despoiled young women. The result is very much its own entity, though it does occasionally offer a skewed perspective on the original novel's events--when Mr. Collins visits Longbourn, for example, the servants are anxious to make a good impression because he will one day be their master, and, as opposed to Elizabeth and Jane's disgust with the man, are overjoyed to find that he is kind and easily pleased. But the main story here belongs to Sarah, the maid of all work, and Mrs. Hill, the housekeeper. The latter is presented as the real power in Longbourn, working hard to keep things on an even keel both upstairs and downstairs, and shrewdly aware of the dangers facing all of the house's inhabitants--from bad marriages, from cruel masters, from designing men, and from the force of the law. But where Mrs. Hill accepts the restrictions of the world she lives in and works within them, Sarah is just working them out, and testing them to see where they have give (one of her most interesting observations is that while for a woman like Elizabeth Bennett it would be an impossible scandal to be married with a pregnant belly, a servant like Sarah could get away with it). In keeping with the Austen template, Longbourn gives Sarah a love story (two, in fact, the first with a freed slave who may be Mr. Bingley's half-brother), which is sweetly and tenderly described. But it ends up feeling less important than Sarah's exploration of her own power and status. Going into Longbourn, it's easy to assume that it will be a story about how people like Sarah are exploited and oppressed by people like Elizabeth, and there is much of this in the novel. But as Sarah comes to understand the marriage game that Elizabeth is playing more clearly, she also realizes her own ability to opt in or out of that system on her own terms, and perhaps to carve out a greater measure of freedom and happiness than Austen's characters get. It's a bit of a fantasy ending, but as a commentary on Austen's blind spots, it is perhaps even more subversive than a straight-up retelling of Pride and Prejudice would have been. Whose Body? 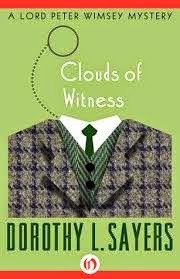 and Clouds of Witnesses by Dorothy L. Sayers - Nearly a decade ago, I read Gaudy Night and then the other novels featuring Harriet Vane, partner and then wife of Sayers's detective Lord Peter Wimsey. But, perhaps because he was overshadowed by Harriet and her fascinating internal debate about whether she could remain her own person if she gave in to Peter's attentions, I never felt much interest in the solo Wimsey novels, and it's taken me until now to look them up. The first foray--and the first book published, in 1923--finds Sayers quite obviously puzzling out her genre, with both book and protagonist in constant conversation with, of all things, Sherlock Holmes. Wimsey references Holmes constantly, and his associate, Scotland Yard detective Parker, is frequently cast in the role of his Watson, with another detective, Sugg, playing the bumbling Lestrade role. But both Wimsey and Sayers are clearly dissatisfied with the template laid out by Holmes, stressing the limits of Wimsey's abilities in the face of inconveniently messy evidence (meanwhile, Parker is also an investigator in his own right, who sometimes sees things the Wimsey misses). It's possible that from Sayers's perspective, looking to Holmes as her most obvious antecedent to the extent of feeling the need to argue with him and his stories' conventions made sense. In 2014, however, it feels like a weirdly old-fashioned preoccupation, though admittedly of a piece with the rest of the novel, whose portrait of post-WWI English society feels very similar to Conan Doyle's late Victorian version. From the vantage point of Lord Peter, his devoted valet, and his imperious mother the Dowager Duchess of Denver, the earth-shattering changes that occurred after the war might as well not have happened--they're all still at the stage of patting themselves on the back for being OK with Jewish people--and the book's depiction of middle class people is positively caricatured. All that said, Whose Body? does raise a crucial question in response to the Holmes model, one that will clearly continue to afflict Wimsey, who unlike the Great Detective can't reconcile his fondness for detective work as a game, a test of his wits, with the life and death stakes of the cases he investigates. How can he, an amateur, justify involving himself, merely for the sake of his amusement, in cases where the end result of his work will be to send someone to be hanged? It's an interesting question, and one that the book refuses to resolve with the simple response that Wimsey is hunting down murderers. An extremely well done scene at the end of the book sees Wimsey seeking out a man he knows to be a killer in order to look him in the eye and understand what he's about to do, and it makes a convincing argument for Sayers's project to complicate and humanize the Holmesian template (this scene also includes a surprisingly accurate, for its period, description of the physiological mechanism of PTSD, from which Wimsey suffers). For the rest of the book, however, Wimsey is a little too much of a clown, and the novel lingers too long over his upper-class affectations--a minor subplot involves his passion for collecting antique manuscripts, with footnotes describing the exact provenance of his Dante folio--in a way that feels almost defensive (I was reminded of Brideshead Revisited's assumption that, because someone has said half a dozen words against the landed gentry, the whole edifice is obviously about to come crumbling down, and it is therefore time to start penning elegies to the class system). The mystery itself, meanwhile, is nicely puzzling but also relatively easy to work out--which I suppose is a point in Sayers's favor since she famously believed that mystery authors should "play fair" with their readers. All in all, then, Whose Body? is clearly a work in progress, but also one that makes a more coherent argument for Wimsey than his supporting role in the Harriet Vane novels had led me to expect. If Whose Body? is flawed but promising, however, its follow-up, Clouds of Witnesses, squanders much of its goodwill. It sees Wimsey rushing to the English countryside after his brother Gerald is accused of murdering their sister Mary's fiancé. The template here is clearly a country house murder, and Sayers's twist on it is that Wimsey is overwhelmed with conflicting and contradictory evidence, because as it turns out everyone at the house had some secret in their life, and nearly all of them were abroad on the night of the murder, running into each, assuming the worst of each other, and interfering with evidence in order to protect themselves or others. It's a clever premise, but the execution leaves a great deal to be desired--the novel opens with a chapter-long recitation of the coroner's inquest, and ends with a chapter-long transcription of Gerald's defense attorney's closing arguments, and in between it mainly consists of Peter chasing red herrings in a way that quickly becomes tedious (one bright point is an understated but nicely done romantic subplot involving Parker, which is clearly intended to recall Watson's similar plot strand in The Sign of the Four). More importantly, if Whose Body? is at least a little coy about its class prejudices, Clouds of Witnesses lays them out in a way that is as bald as it is infuriating. There are, for example, the chapters devoted to castigating socialism, and particularly Mary's lover, who is exposed as a coward, a fool, and just generally lacking in the sort of grit that naturally noble people like Peter possess. Even worse is the sub-plot about the battered wife of a local farmer, who lives in genuine fear of her life but whose well-being is considered less important than the fact that her testimony could save her noble lover--at one point Peter even opines that it would be a shame if this woman's husband murdered her, as Gerald would have to live with the guilt of it. And then there's the fact that the whole novel revolves around Gerald being tried in the House of Lords rather than an ordinary court, which none of the characters find strange or unjust. I'm still interested in reading the other Wimsey novels, but after Clouds of Witnesses I can see that I'm going to have to steel myself against their prejudices. It amazes me that we have the exact same book list, except for Saga. And pretty much the same opinions of most of them! Now I'm very curious to read the second half and see if they match up as well. Nitpicking terribly, it's CLOUDS OF WITNESS (a distortion of the quote from Hebrews 12:1, "cloud of witnesses"). My sense is that Sayers got better and better as she went along, but she was who she was, so there are some prejudices that remain. I loved SWORDSPOINT, and its sequels, long and short, as well. Probably one of the few series with one book (a middle book) written in collaboration without the author having died. SWORDSPOINT seemed for a long time a canonical "non-fantasy fantasy", but then its sequel showed that there is magic in that world. Still haven't read LIFE AFTER LIFE. My wife, who reads Atkinson's mysteries, started it but gave up -- not her thing. So glad you enjoyed Swordspoint! I'm really amazed that it isn't more widely known - a fantasy novel written by a woman featuring gay male characters written during the AIDS epidemic (and my copy has a blurb written by noted homophobe Orson Scott Card on it, which is just icing on the cake). When people discuss the voices of women and LGBT people in the fantasy genre, I'm constantly surprised this series isn't mentioned more often. I have actually read Swordpoint, ages ago. I liked it okay, and I especially felt that the descriptions were very good, but I felt like it was a bit meandering in its plot. I did, however, really like the three short stories that were added to the back of my copy, and I remember thinking that perhaps it took the whole novel to establish a (non-supernatural) mythology - most notably in the form of Richard's superlative fencing skills and his and Alec's epic love affair - that other stories could build on. I never did get around to reading any longer sequels (I know there is at least one), though, which might be a shame. Saga is great, isn't it? It's the first thing I've seen Brian K. Vaughn do that works-- Y: The Last Man has interesting bits, but suffers from having pretty much been done before elsewhere, and also from a clearly not-that-carefully-planned ending. But Saga, well, partly it's that Staples' work is spectacular, but I also get the sense that he actually knows the entirety of where he intends to go, and I look forward to watching him get there. Are you determined to read Wimsey chronologically? Because they went down for a while before going up. In my opinion The Unpleasantness at the Bellona Club is the low point, although I have seen well-reasoned arguments for Five Red Herrings being worse. If you are not being completist, skipping to Nine Tailors or Murder Must Advertise might improve your reading experience. Are you determined to read Wimsey chronologically? Well, since I've already read the Harriet books (and not in chronological order either: I started with Gaudy Night, went back to Strong Poison and Have His Carcase, and skipped on to Busman's Honeymoon) it seems only fair to go by chronological order now. 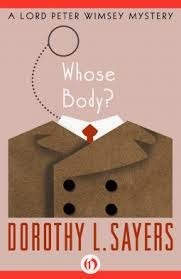 And I'm interested to see how Sayers develops Wimsey and the people around him - there's already a surprising amount of continuity between Whose Body? and Clouds of Witness. It might be interesting to finally read these books as their author intended them to develop, instead of jumping in and out. I had a somewhat a different take on Longbourn, here. 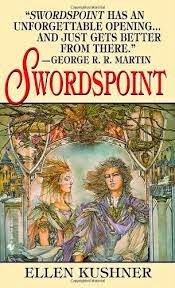 Initally, even pre-pub, I loved Swordspoint which I read in ms. But with each re-reading and each subsequent volume, the precious archness, etc. -- it became too preposterous to up with put, for this reader.